We love pumpkin pie at my house. My brother and I often choose it as our birthday treats (my day is close to Thanksgiving and his close to Christmas), and we are happy to eat it any time it is considered "in season". Maybe we'd eat it other times too if we thought of it. 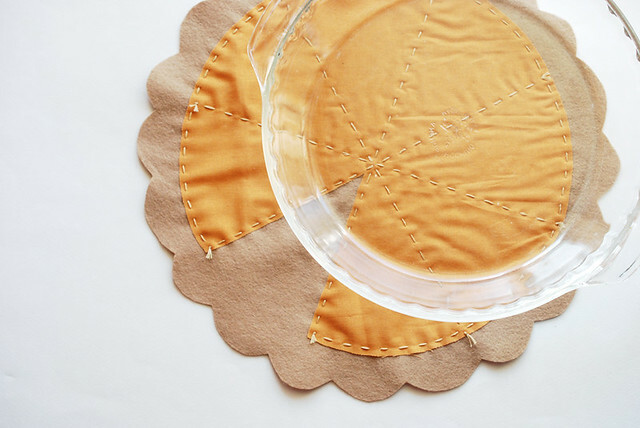 This Thanksgiving, our pie will have a bit of extra decor because today in Alphabet Month, P is for Pumpkin Pie Mat. 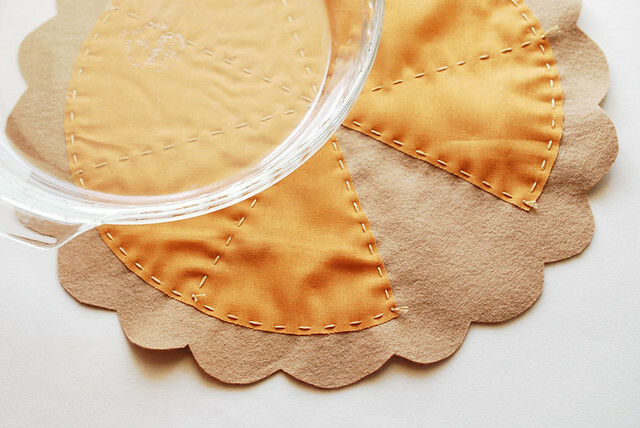 Think of it as a special placemat just for your pie. Hey! It's important and deserves a place of honor! I've made this as a pie with a missing slice, although it could be considered confusing that you see the crust left where the pie has been removed. When I mentioned this to my sister, we entered into a conversion that I referred to as the theology of pie. It's a long story, but just go with the crust showing, mmmkay? The pattern is a quarter of the pie, so to make it full size, print four copies. Then, assemble them as a crust and a filling. Cut one dashed line slice out of the filling. NOTE: You could print one copy, then fold the fabric into quarters, but it's more likely to have some distortion, especially with the felt. Cut a crust from tan felt and a filling from fabric. I'd like to point out here that you could use other filling colors for other kinds of pie (Think cranberry or chocolate! Yum!). Center and pin the pieces together. 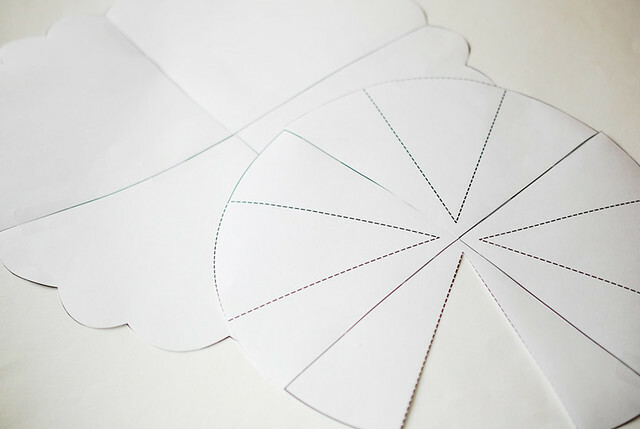 Using a ruler and a disappearing ink pen, divide the pie into eight slices, with lines on either side of the missing slice. I'm not a huge fan of this type of pen usually, as the lines disappear too fast for my liking, but it's helpful in this case so you don't have to rinse it. 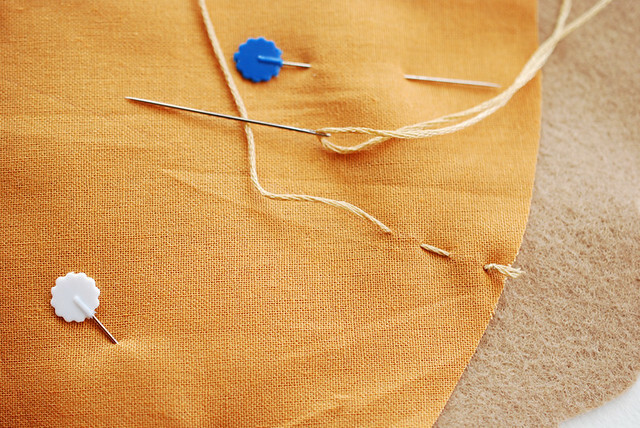 Cut a length of embroidery floss and use running stitch over the lines. (See? the lines were already starting to vanish as I was working on this!) I opted to have knots on the top of the fabric at the start and finish of each "slice". Also, when you reach the center, try not to have the stitches overlap with each other. This means you may have some longer stitches underneath or hidden between the layers, but you'll have a nice star burst in the middle. 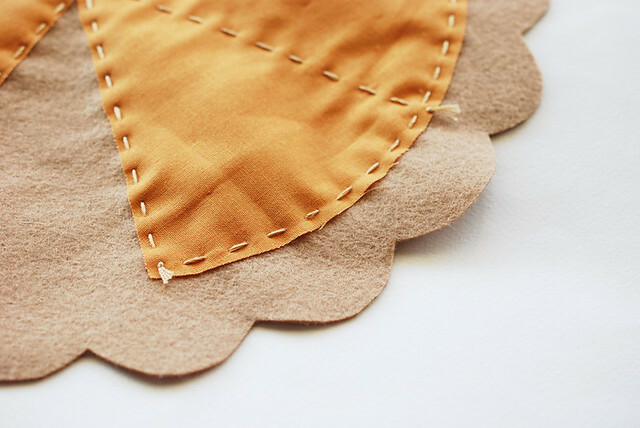 Stitch around the outside of the pie with running stitch. This time, I hid my knots! 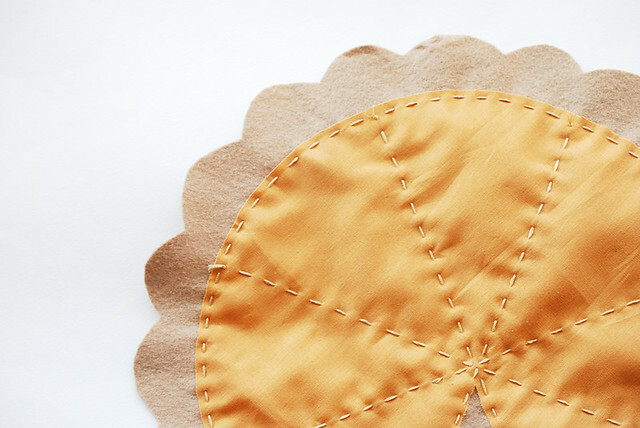 Add a pie, and you'll have a very happy Pumpkin Pie Mat. And an even happier crowd of hungry guests! 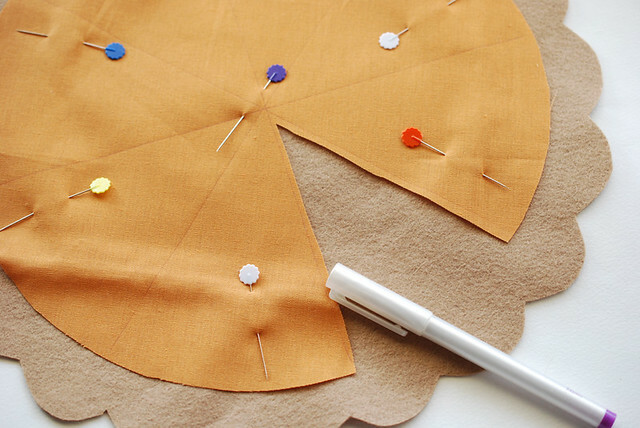 You could add another layer of felt in a different color - say white - and it would be the pie plate holding the pie. Then you could take out the scalloped edge to make it look more realistic. It would also add another layer of insulation to protect the table if it is a hot pie. As in Chicken Pot not stolen! Love the idea though and once angain I'll say YOU are a Genius! Wow! I also request pumpkin pie for my birthday. My birthday is early in November and starting last year I requested pie instead of cake. In order to limit my consumption of pumpkin pie, I made a rule that I can't have it until November. Such a treat. I will definitely make one of these! I like pumpkin pie, but because I am the only one in the family who does, I rarely have some. I have to buy a slice at a time at the bakery or at a restaurant etc. This is so darling, Mollie!! White pompoms might make good whipped cream.